Mid-Island home close to beach access via 5th Street and the center of the island. This 4 bedroom / 2 bath house sleeps 9. Main floor bedrooms have a king bed and a queen and single. Upstairs there is a queen in one room and 2 singles in the other. 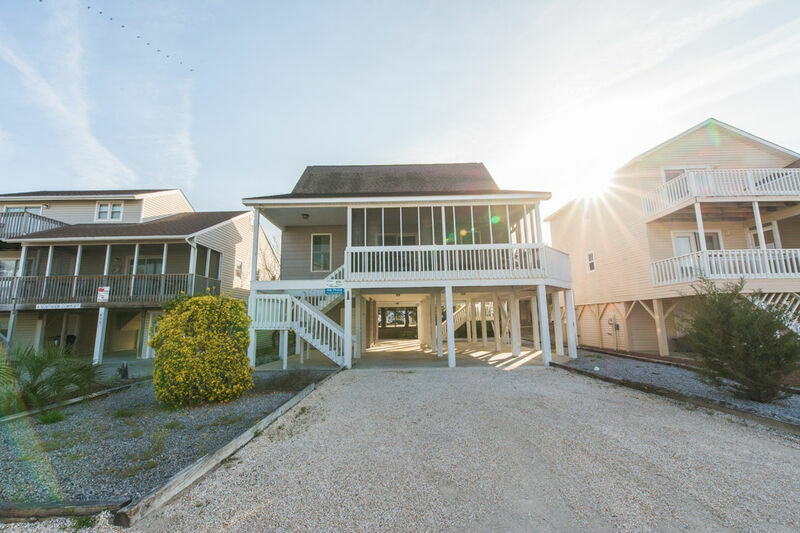 Enjoy a large screened porch for relaxing with views of the ocean, ICW and marsh scenery. Fully equipped kitchen makes meal prep and clean up a snap; a high chair is available for the little one. Very comfortable living area leading out to screened porch. There is a flat screen TV in living room and master bedroom, DVD in living room and Blu Ray in the master bedroom - Wi-Fi throughout. Convenient outside shower. No smoking or pets permitted. This rental was perfect for our family of four. It is nicely decorated and clean. The kitchen has a wonderful supply of pots, pans, and other cooking utensils. However, bring your spices, oils, and other pantry items. The only food items are the salt and pepper shakers. The porches are fabulous, the porch furniture leaves something to be desired. We used our beach chairs. 5th Street was quiet and peaceful.